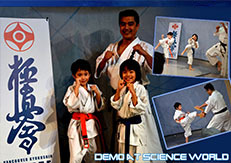 On Sunday, January 26, we had a very rare opportunity to put on a demonstration at Science World in Vancouver BC. We were given a main stage "Peter Brown Family Centre Stage" where we saw lots of people joining our 30-minute demo. Since the stage space was limited, we only brought two students from Downtown Dojo. Seo Jin and Kai did a great job in performing Kihon, Pad Works, Self-Defence and Board Breaking. We also had a bunch of children from the crowd try out some of the techniques we showed. The demonstration seemed well received by all. Hopefully, it helped the spectators understand karate and become more interested in the Art. I would like to thank Will Weakly for connecting us to Science World, one of the most-visited attractions in Canada. Special thanks goes to Paul and Stephan of the facilities for coordinating all necessary arrangements for us. We had a great time. Osu! This entry was posted	on Friday, January 31st, 2014 at 8:53 am	and is filed under Uncategorized. You can follow any responses to this entry through the RSS 2.0 feed. Both comments and pings are currently closed.